Opis: Nisi Prius (Classic Reprint) - Browder J. C.
To the Bench and Bar these desultory chapters are, with more or less trepidation, respectfully submit ted. They were prepared at odd moments and under circumstances well calculated to hinder and impair consistent effort in such a line of endeavor. It will be accepted as axiomatic that the Law is a jealous mistress and will not brook a division of homage. Even as one cannot serve God and Mammon, you cannot serve the Law and - anything else. This is said, not by way of apology, but in explanation of the many imperfections and short comings which have found place in this volume. As to the venue, no less than to the personal identity of those who appear in this chronicle, a prefatory word may not be out of place. Mecklenberg County will not be found on the map of Kentucky; nor does its seat of government, the town of Greenwood, appear there. Nevertheless, the author gives assurance most respectfully that both Mecklenberg County and the town of Greenwood are very much in Kentucky, and have intertwined themselves into her history from the early infancy of the Commonwealth. Touching the personal identity of those who grace the pages of this history, a more difficult and delicate task is presented. Realism and Fiction by joint and common effort have created them. 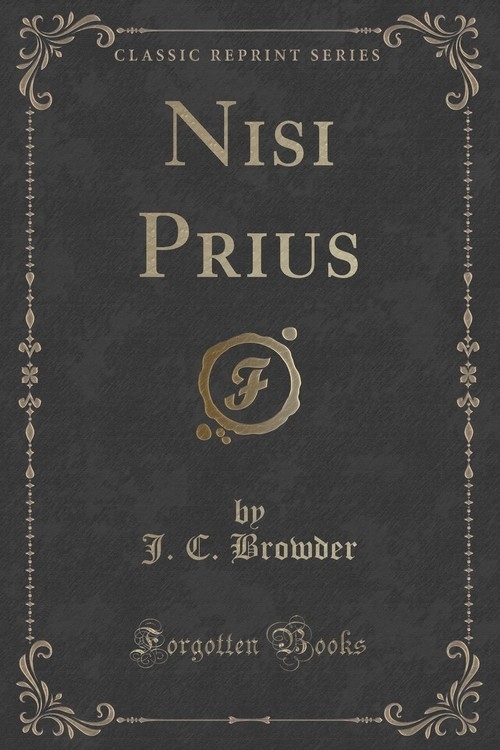 Szczegóły: Nisi Prius (Classic Reprint) - Browder J. C.
Recenzje: Nisi Prius (Classic Reprint) - Browder J. C.